Medium is a newly announced publishing platform initiated by the Obvious Corporation. With Medium, the founders of Twitter and Blogger are “rethinking publishing … from the scratch”. The site is to be launched in early 2013, and is now open for publishing only for a select few. Publishing on Medium is organized around topics. Topics are called collections and consist of posts by all users rather than a single author; an organizing principle similar to sort-by-tag on platforms like Tumblr. While users are likely to pick the right collection for their posts, the collections themselves, so it seems, are decided by Medium. Evan Williams, CEO at Obvious, has stated that he “would like to keep Medium relatively high-quality”. Not having an open vocabulary, in which users can freely categorize their posts, makes certain sense and does not necessarily raise a wall around the platform. Medium suggests to be(come) a space where users can freely cultivate their creativity (but) in designated areas. 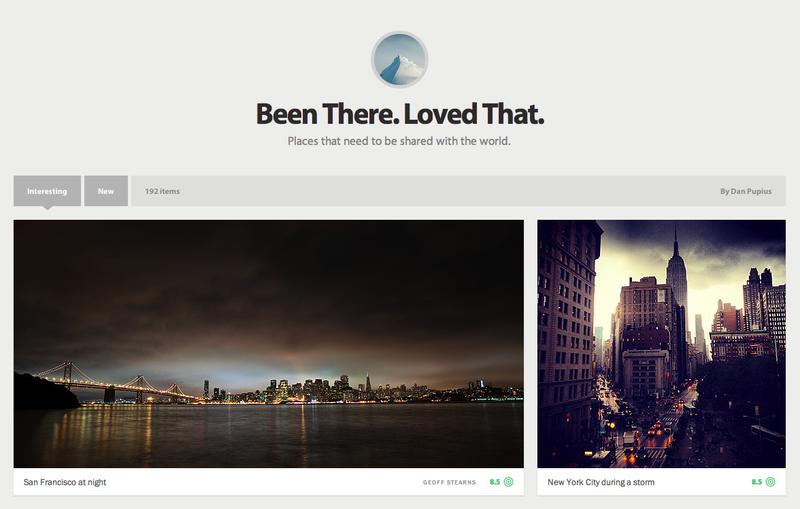 ‘Been There, Loved That’ is one of Medium’s first collections. Although most users can’t publish yet, it is already possible to give kudos to the available posts. This rating mechanism is the principal organizing principle on Medium. Refined by algorithms, the highest-rated posts show up at the top of every collection. This way, it is not the post-date or the author’s reputation but the ‘quality’ of the content that determines a post’s visibility. This, indeed, is a new approach to publishing. Not necessarily better, but different, Williams asserts. While Medium allows for discussions from many angles, this review will focus on what we believe are two of its crucial characteristics: content discovery and authorship. Medium offers an interesting approach to content discovery. Rather than presenting content in reverse chronological order, a form of publishing popularized by blogging, or via a Facebook-like newsfeed, Medium lets users discover posts by their rating, “helping people get the most out of their time in this world of infinite information.” In a way, this is a response to Faris Yakob’s remark that “media space is growing as such an exponential rate that it is essentially infinite.” Since we cannot try everything ourselves, we have rely on recommendations, Matt Musick states referring to the hour/second ratio in which new content is now uploaded to YouTube. Plain popularity, such a page views or inlinks, is not necessarily the best indicator for discovering relevant content, as several Web commenters point out. True to their “Not too big, not too small” maxim, Medium can be said to offer an in-between solution to the current forms of presenting content by ordering posts based on what could be called relative recognition. This ranking system is based on rating frequency rather than on absolute popularity. Medium is yet to be launched, but the idea of collective curation – as this approach might be called – looks promising in terms of fighting positive feedback loops, in which popularity acts as a self-reinforcing factor. Simply put, kudos need to keep up with page views in order to retain a certain rating. Effectively, a non-vote weighs in as a vote down because the like-frequency will slightly drop. So, while Medium is still “an environment shaped by earlier users,” this does not structurally determine how attention is distributed over time. Posts on Medium are like athletes: they can’t be the best forever because their rating will inevitably decrease over time. Meanwhile on YouTube, 2006’s The Evolution of Dance is still amongst the all-time top videos. Online publishing platforms are often said to empower the individual. Blogger and Twitter, that have enabled Web users to create an active reader/follower base for their ideas are two well-known examples of this. In contrast to these platforms, Medium degrades authorship. The focus on content makes the author secondary, having only a link to their Twitter profile and not to their other posts on Medium. What could the lack of Authorship, in capitals, mean for this new platform? Medium could be for online publishing what the newsstand is for print media. As with magazines, content is organized around interests (e.g., Wired vs. National Geographic). Readers work as editors, collectively deciding on the ‘page-one posts’ for a certain collection. Collections reflect the community’s consensus on what is good. This by no means has not has to align with what the authors think is most important. How their content is being received simultaneously determines the visibility of these posts. In a different way, this empowers the individual because Medium allows unknown authors to be amongst the top authors. However, because content is king, single authors can’t be. Warning! Your message may turn against you!